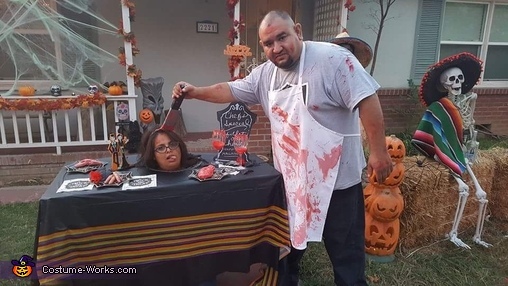 Because I always have to go a step beyond but on a budget, I was going to be a head on a platter on a table for Halloween, lol! This costume was super easy & cheap! I got a big cardboard box, cut it open and cut the edges off (left some parts that folded over to make it a lil more stiffer). Cut a hole in the middle to fit my head. I then hot glued a plastic table cloth from the dollar store with other things from there as well like plates, forks, severed fingers and a chalk board saying Chef's special: filet of heart. I also used fake intestines. I had this white apron I had my boyfriend put on and we splattered it with fake blood. He also put blood on his face. My Neighbor touched my costume up perfectly from letting me use her plastic butcher knife on a headband!